It’s funny how things work out sometimes. When we finished Leap: Rise of the Beast in spring of 2011, the plan was to spend a year prepping Leap: Revelation and to shoot it the summer of 2012. Instead, I was whisked away to Montana and then found myself homeless that summer. I managed to write the first draft of the script, planning to shoot the following summer, but I knew I needed some funding, so I held out. I didn’t do much with the script the following few years, but about a year ago, I got serious and said that now is the time to do it. In the past four years, my understanding of God, His character, His plan, and last day events has changed pretty dramatically. Because of this, the message and focus of the film has shifted a bit too. I love that God knows what He’s doing. If we had shot this right away, I don’t think the film would be nearly as powerful as it can be now. The other great thing about it taking so long is that I’ve been able to slowly accrue gear over the past few years and now have some pretty nice things to play with this time. When we did Leap 2, I was all about Low Budget Pride. We did the movie for $2000 and I was proud of it! We were all about the workarounds, the hacks and trying to avoid spending any money. While it’s good to be frugal, I’ve since learned that having some toys actually makes life easier on set. Shooting a movie, while a lot of fun, can also be pretty stressful at times, especially with hacked and DIY toys. I’ve learned that sometimes, it’s good to have the real things. Before I had the camera, a multi-function tripod, some work lights, a green sheet and a shower curtain. Now I have two cameras, plus a GoPro, shoulder rig, nice tripod, slider, real movie lights, Glidecam, reflectors, diffusers, real greenscreens, a few lenses and decent mics. We’ve come a long way. Speaking of coming a long way, so has my effects abilities. When I think back to Leap 2, I was just learning After Effects and was so excited about point tracking and corner pinning. Almost all the effects shots consisted of some form of tracking and corner pinning. Lots of screen replacements, the gunshot wounds, etc… I had one scene that was all greenscreen, once shot with roto, and one set extension as well. As I go through the script for Leap 3, the effects we’re looking at are much more ambitious. 3D tracks with CGI security cameras and hailstones, quite a few set extensions, probably a fair amount of roto, rig removals and of course loads of screen replacements. We’re also bringing makeup effects into the pipeline with the plague of sores and we’re taking parkour out of the city and into the mountains. What’s funny, is that when I wrote the script for Leap 2, I had no idea how I was going to pull some of that off, and then I discovered After Effects, and it was like I heard the angels sing. This time around, there’s nothing in the film that I haven’t done before, either on my own or for work, the challenge this time is just the sheer volume of effects we’re dealing with. We have a big mountain to climb as we prepare to shoot this August, so please continue to keep the film in your prayers. The breakdowns are done and I’m working on the new schedule now. Hopefully start casting in about a month or two. Hang on, it’s gonna be a wild ride. Been staying busy doing some more effects testing, did a shot of a lake having turned to blood that came out pretty good. Still needs work, but that’s why I’m starting the on certain effects right now, so I have the time to develop them and figure out how the movie will need to be shot. With this new laptop, I finally had the power to take my HD master of Leap: Rise of the Beast and convert it for a web upload. My upload speed out here isn’t anything to write home about so it took six hours to up the one gig file. The important thing now though is that the film is online available for all to see, for FREE (remember when things were free?) Hopefully this gives them that need to see the film they opportunity to. With my switch to Adobe official, I recorded a short vlog yesterday highlighting my reasons. With the trailer for “Run” complete, I’m getting ancy. I NEED something to edit and mix so I can hone my skills for Leap 3. I realized that I never was fully happy with the trailer I did for Leap 2 so I’m putting Premiere to yet another test by importing all my footage from Leap 2 – every last take – and I’ll cut a new trailer. The import is going slow, but steady. I can live with that. I have to remind myself that I’m trying to do an online edit on a middle of the road laptop. Fortunately, once the ministry is up and going, the first two things I’m purchasing is a beastly editing/effects rig for the studio and a beefy laptop to travel with me. With the abuse I’m putting on my current laptop, I’ll be surprised if it lasts a year. I finished the business plan for the ministry yesterday. While it was a lot of work to write, I’m very glad I did it. The budget is basically done too – all I’m waiting on is for an insurance company to get back to me with a quote for employee benefits If it’s too much, I have no problem nixing it, but I figured I might as well see what it’ll costs. Other than that though, everything looks pretty solid. I worked really hard to get exact costs when possible because I didn’t want to under estimate, or over estimate for that matter. It struck me today just how odd this industry is. For filmmakers like myself, our life revolves around stories- intangible thoughts that invoke feelings in those that listen or view them. Often times when a director is asked why it’s taking so long for the new Indiana Jones movie to go into production, he replies, “We’re working on the story”. As I’m sure many of you are aware, most movies aren’t just made up on the spot. They’re based on a script, which is simply a document that states everything that happens and and everything that is said. It goes without saying that there’s a lot involved to take a movie from script to screen, but few realize that the process to get that good script can be just as much work, if not more. 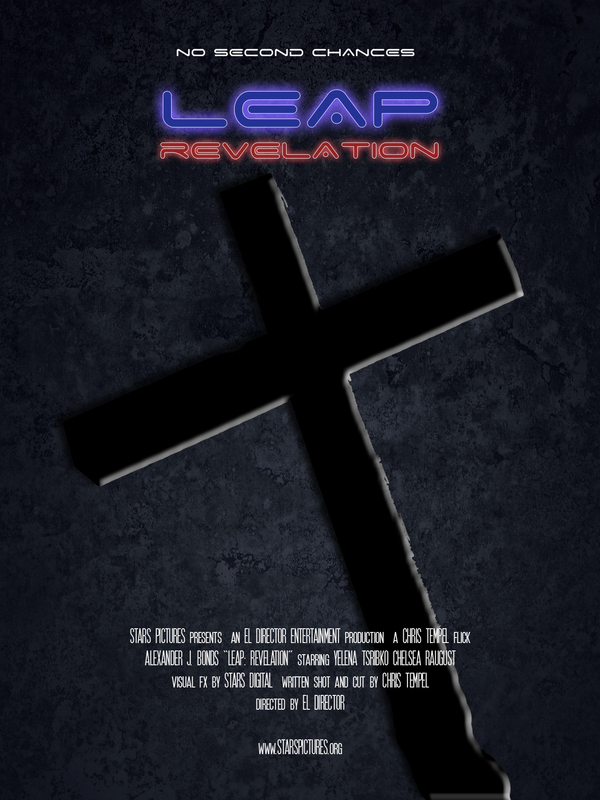 What follows is the story behind the story of getting to the third draft of a script for “Leap: Revelation” (I’m on draft three now, and need about five more before it’s production worthy). Once upon a time I woke up one morning with an idea for a movie. This movie would combine parkour and the end times together and would be told from a personal, rather than political point of view. That’s all I knew at that point. I had been studying the end of days myself at that time, and what I was learning wasn’t what is being taught in most churches. That controversy would be my hook. The first thing I did was make a list of issues I wanted to address. This list would grow over time. I started mapping out a story outline in Microsoft Word that began in present times and would take the viewer to the second coming of Christ. I soon realized that the film was getting way to big, so much like George Lucas and Star Wars, I took the first act and said, I’ll make the movie about this. To actually write the script, I would lay on my couch with a movie on and my laptop on my thigh. Day after day, night after night, for three months I did this until the first draft was completed. As I wrote, there were certain things that I knew would happen in the other two films that would relate back to this first one. I knew Crystal didn’t pull the trigger, and I knew that eventually the group would be living off of manna from Heaven, so I planted that seed too. Getting this first draft out is always the hardest and it’s usually pretty rough since it’s just getting the basics down on paper. I began to cast the film and met Alex Bonds who would go on to play Shane. Alex took the script and brought a lot of ideas to the character. About seven drafts later, we shot the “Leap” in the summer of 2009. While I posting the film (editing, sound effects, color grading) I would take breaks and start to work on the outline for the second act, “Leap: Rise of the Beast” with a buddy of mine, Chris Trechter. We mapped out most of that story over a few all night brainstorming sessions. I had things I wanted to say in the film were still on my last (which I had added to) and this served as our foundation. Just like before, I wrote the first draft over a three month period, laying on my couch listening to movies. That’s one of the reasons why a lot of movie quotes end up in my films. I gave the first draft to Alex, and seven versions later we shot it from August thru December 2010. After ROTB, the initial plan was to do something else. I knew Leap 3 would end with the second coming and that it would be very CGI heavy, so Alex and I decided to do another film first. It took me eight months working off and on to write “Derek”, a supernatural, biblically accurate, thriller about demon possession. 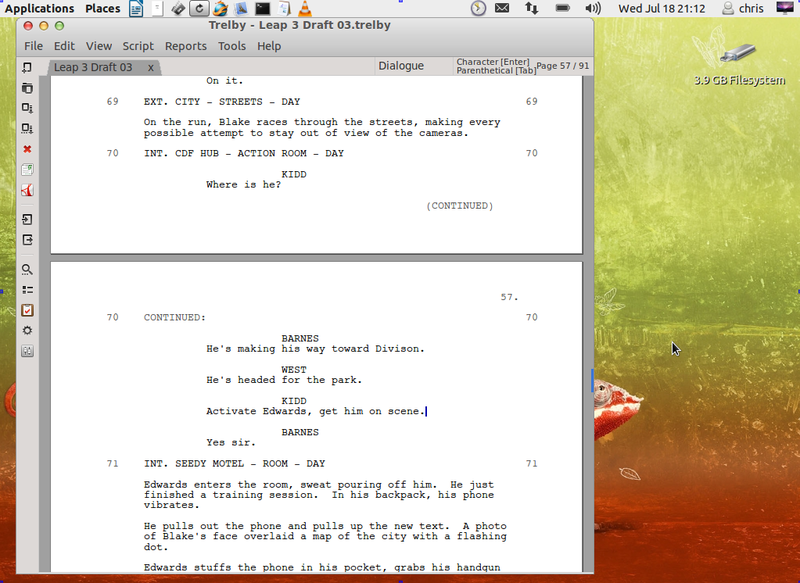 When that script was done and I began to move into pre-production, people kept asking me about Leap 3. Hardly anyone wanted to see Derek yet. Everyone wanted to know what happens to the Leap Crew. So, two months ago I pulled out my file for the Leap Trilogy. I still had a lot of items on my list that needed to be addressed, and this was my last chance to do it. Since I’d been thinking of this film for three years by this point, I held off on writing and outline and just started writing the script. A month later I had finished the first draft. And I sent it out. Due to the nature of my beliefs, and thus the beliefs expressed in the film, it is pretty controversial. If Rise of the Beast went after the Vatican, this one basically goes after everyone else. BUT, my goal is to make people think and study. I laid out scriptures and historical facts and I would encourage anyone that reads the script or sees the film to check them out. There’s a lot of research in these films, And in all honesty, the time involved researching and writing the scripts is probably equal to or greater than the time I’ll spend in post on this one. Looking at the picture below, that’s the big secret kids. Almost every movie you’ve seen started life in a word processing program for writing scripts. I still find it almost magical taking the thoughts from my head, putting them on paper, and bringing that paper to life. That is why I became a filmmaker. Good and news and bad news for day. Actually a lot of news. A little over a month ago, I prayed that God would bring me closer to Him, like when I had to live day by day a few years back. Not long after praying this, I lost the house I was staying in, and my job soon after. I figured that if I had to be homeless, I’m glad it’s in Montana. I spent the next three weeks camping and living in the wilderness. I kept a journal that I would love to turn into a film. A week ago, while driving to my wilderness home at night, my car blew up (threw a rod) and that was that. I’m currently staying with a couple from my church. Anyway, just before I lost my job and the house, I launched a kickstarter campaign for “Derek” and prayed that if the Lord wanted that film made, He’d open doors for funding, and if not, he’d shut them. Well, a month later, we didn’t even come close to our goal, so that’s a pretty clear shut door. Ever since the premiere and DVD release of “Leap: Rise of the Beast”, people keep asking me what I’m doing next. When I told them about “Derek” and how cool it was, all they’d say is “Yeah, but what about Leap 3?” So, seeing that’s what people want, that’s what we’re doing. I started writing the script last night, I also designed the logo and a poster. The film opens about a week after ROTB ends and the very first shot is an explosion. Go big or go home, right? As for the message of the film, ROTB introduced the concept of the Vatican being the beast and touched on the Sabbath vs Sunday issue and it’s importance to the mark. “Leap: Revelation” will explore why the Sabbath is so important and why it still applies, especially in the end days. Of course, my main mission is still the same-get people to actually read their Bibles and study for themselves. Alex and his wife Jess are coming out to Montana today to sign DVDs for “Leap: Rise of the Beast” and also to shoot some effects test for “Derek”. Not getting into too much detail yet, but the effects are from the climatic sequence of the film, so I’m excited to see how this goes. I’ll be trying the Flaat 2 picture style and also my homemade slider. The biggest bummer is that all my lights are still in Spokane, WA and this is an indoor scene. May have to open a bunch of windows or something. The script has been finished for a few weeks now, and I’ve been working on the budget. Right now, we’ll need about $45k to cover salaries and a few pieces of gear, plus an additional 10k to cover the “perks” when we launch our kickstarter, so total amount will be around $55k. I think it’s doable, but only if done right. I’ve given a buddy from high school the title of Social Media Producer and he’s been helping to grow our fanbase on facebook. The more fans we can get now, the easier it’ll be to raise the funds. One of the ways we’re growing fans is with contests. For instance, when we hit 50, I let everyone read the first act of the script. We hit 50 in only 3 days. Our next goal is 100, at which point there’ll be a special shout out in my next video log as well as said video log being released. As our fanbase grows and we move closer to production, the stakes will go up. Some future prizes I have are similar to the kickstarter perks: calling action over Skype, a prop, signed photo of the cast and crew, that sort of thing. I really want to stay engaged with the fans this time, as well keep the production transparent.